Mass flow controllers (MFCs) are used to measure and control the flow of liquids and gases. A mass flow controller is designed and calibrated to control a specific type of liquid or gas at a particular range of flow rates. Fluid Controls can supply a complete range of Mass Flow Controllers from leading manufacturers Porter and Bürkert Fluid Control Systems. Porters mass flow controllers have extremely quick response times, and are available in numerous configurations and flow rates to satisfy a variety of demanding flow control applications. 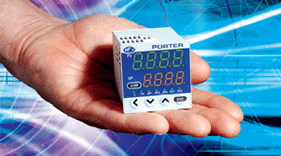 Porter’s mass flow products are accurate, reliable, cost effective solutions for your mass flow applications needs. Porter MPC Series Mass Flow Controllers represent a totally new concept in cost-efficient mass flow control. These units contain both a fast and accurate mass flow controller and the necessary electronics for a complete closed-loop control system, all in a compact, panel mount, 1/16 DIN package. The front panel includes the interface for all functions, as well as readouts for setpoint, flow rate and total flow. Alarms, batch control and multiple setpoints are programmable for enhanced versatility. 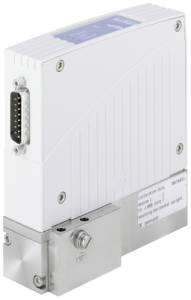 The MPC Series operates on 24 Vdc and has remote analogue I/O capability. These controllers are available in full-scale flow rates of 0.5, 2.0, 5.0, and 20.0 SLPM N2. Porter Mass Flow products reflect nearly three decades of experience in the design and manufacture of precision instruments for the measurement and control of gas flow. They incorporate design principles that are simple and straightforward, yet flexible enough to operate under a wide variety of process parameters. The result is flowmeters, flow controllers and control valves that are accurate, reliable and cost-effective solutions for any mass flow application. 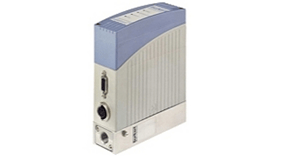 Bürkert Mass Flow Controllers (MFCs) are compact devices that control the mass flow of gases. They control a preset flow rate reference value – regardless of disturbance variables such as pressure fluctuations or temporary occurring flow resistances. MFCs consist of the following components: flow sensor, electronics (with signal processing, regulation and valve control functions) and a solenoid control valve as an actuator. Fluid Controls can supply the broad range of Bürkert MFCs for gases, including the Type 8006, Type 8710, Type 8712, Type 8626 and Type 8711. Bürkert Fluid Control Systems is a world leading manufacturer of control and measuring systems for fluids and gases. With a wide range of solenoid coils and standard process valves, they also have the facility to adapt and develop existing technology to suit your needs. This focus on problem solving and application specific solutions means the products have a wide variety of applications and are used in industries such as Water Treatment, Hygienic Processing, Gas Handling and Microfluidics. Porters mass flow controllers have extremely quick response times, and are available in numerous configurations and flow rates to satisfy a variety of demanding flow control applications. Porter's mass flow products are accurate, reliable, cost effective solutions for your mass flow applications needs. New to this range is the 'All in one panel mount gas flow control system' - to reduce size, cost and complexity. MFC are compact devices that control the mass flow of gases. They control a preset flow rate reference value - regardless of disturbance variables such as pressure fluctuations or temporary occuring flow resistances. MFCs consist of the following components: flow sensor, electronics (with signal processing, regulation and valve control functions) and a solenoid control valve as an actuator.